Barnes is a district in the London Borough of Richmond upon Thames. 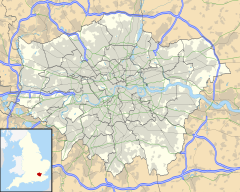 It takes up the extreme northeast of the borough (and as such is the closest part of the borough to central London). It is centred 5.3 miles (8.5 km) west south-west of Charing Cross in a bend of the River Thames. ^ a b c "London's Rail and Tube services" (PDF). Archived from the original (PDF) on April 10, 2019. ^ "Estimates of station usage". Office of Rail and Road. Archived from the original on March 27, 2019. ^ "TfL Base Map" (PDF). Transport for London (TfL). Archived from the original (PDF) on April 7, 2019. ^ "London Borough of Richmond upon Thames: Air Quality Annual Status Report for 2017" (PDF). London Borough of Richmond upon Thames. May 30, 2018. Archived from the original (PDF) on April 13, 2019. ^ a b "Route 4". Sustrans. Archived from the original on December 30, 2018. ^ "EuroVelo 2: United Kingdom". EuroVelo. Archived from the original on July 1, 2018. ^ "London's River Services map" (PDF). Transport for London (TfL). Archived from the original (PDF) on August 8, 2018. ^ "Literary papers of playwright and author Thomas Nigel Kneale including screenplays, scripts, correspondence and press reviews – Archives Hub". Retrieved 2018-01-26.